TMHU, the No. 1 selling lift truck in North America for the last decade, has been headquartered in Irvine since March 2002 at 1 Park Plaza in the Jamboree Center, an Irvine Company property. TMHU currently employs 72 associates in Irvine and another 53 in Columbus. The majority of Irvine associates are being offered relocation and those not moving will be offered severance and job placement assistance. 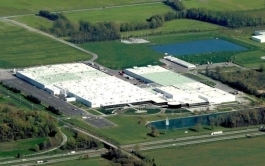 TMHU's existing Columbus offices are physically connected to Toyota Industrial Equipment Mfg., Inc., a zero landfill manufacturing facility where the majority of Toyota lift trucks sold in North America are built. "Bringing all TMHU associates under one roof will allow us to be more responsive to customer and dealer needs," said Jeff Rufener, TMHU president. "Being on the Columbus campus with our forklift plant will result in more synergies and improved communications between sales and marketing and manufacturing." The Irvine move is part of a larger Toyota Industries Corporation (TICO) global vision. TICO, the parent company of TMHU, conducted similar relocations to align sales and marketing with manufacturing plants in Takahama, Japan, and Mjölby, Sweden. In March 2012, Forbes named Columbus one of America's 10 prettiest towns. In November 2010, Forbes magazine selected Columbus as one of the top ten best small cities to raise a family, saying Columbus is one of the cities that "sweep our ranking of quiet, prosperous, and family-friendly places . . . these places boast solid average incomes, good educational prospects, low costs, short commute times, and high rates of home ownership." Columbus was selected as one of only three Indiana cities for Relocate-America's Top 100 Places to Live in 2009, which noted the frequent accolades the city receives "...aren't without good reason with the city's impeccable art, lush landscaping, a first-rate park system, and of course, the outstanding architecture." Columbus was recognized as one of America's Top 100 best places to live and launch a business by Fortune Small Business magazine in its April 2008 issue. National Geographic Traveler's "109 Destinations Rated" issue ranks Columbus, Ind., 11th on its list of historic destinations worldwide and describes Columbus as "a world-class collection of modern architecture by master architects . . . it is authentic, unique, and unspoiled . . . this town is truly part of America's architectural heritage."